One of the supreme “Don’ts” that is almost implicit in book reviewing is “don’t review books written by friends.” I reflected on that when I started writing this review – the author and I are Facebook “friends.” Because of Facebook’s Orwellian double-speak, “friend” doesn’t necessarily mean friend, any more or less than it means the opposite. I really don’t know Srygley-Moore except through her poetry, and our “chats” have been mostly limited to me asking her for a review copy of this book and her asking for my mailing address. However, Facebook is where I discovered Carolyn Srygley-Moore’s poetry. She posts notes containing her poems at an astonishing rate, and they are almost always very good poems, perhaps made more striking by the fact that they are published on Facebook, a decidedly non-poetic medium. 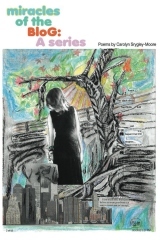 Srygley-Moore has been writing for many years, but this is her first full-length book of poems. miracles of the Blog is a potent, powerful collection that showcases the work of a poet at the peak of her considerable powers. She can’t be pigeonholed; one could call quite a bit of her work “confessional poetry,” but she can’t be labeled, much less written off, as a confessional poet, any more than she could be considered a “language poet,” though there are traces of that school as well. They jostle among the comic, the mystical, the pop culture references, and the sometimes surreal or absurd imagery that Srygley-Moore employs throughout her book. The title of every poem in the book begins with the word miracles: “Miracles of Bird Watching with Hitchcock,” “Miracles of Cartoon Realisms,” and “Miracles of Lady Gaga & Jesus” are three examples of many titles that throw the word miracle into sharp relief and ultimately strip it of the portent it usually carries, its definition being a product of the divine and/or the otherworldly. Srygley-Moore’s intent, I think, is not to cheapen what we think of as miracles, but rather give the reader the gift of seeing the miraculous in the everyday by naming the mundane and the outrageous as such. Srygley-Moore’s been writing poetry long enough to have developed an original approach to poetic form that works with and outside of traditional unrhymed tercets, quatrains, and the occasional sonnet. Many of her poems prior to this book contained double slash marks (//) within the lines themselves, suggesting a severity in tone as well as a bold self-referentiality. Srygley-Moore actually addresses this use of the double slash in one of the poems in her book, and why she no longer uses them. In their place, she’s begun using word-length spaces to separate phrases in the same line, so that her poems begin to look like a visual poem, but doesn’t use enough of them to make her work unrecognizable as a series of lines and stanzas. The spaces are hints of a different kind of pause than the one afforded by linebreaks. They seem to be inviting – not commanding – the reader to pause mentally for an undetermined amount of time. They produce an effect very different from the linebreak; it’s as if the poet is saying “this is where prosody would like you to pause, but THIS is where the poem pauses. We die alone a friend says. praying for the phone to ring. & a cup of coffee & reruns of The Prisoner. (from “Miracles of going into hiding”). I became convinced that this review needed to be written and published as soon as possible not only because great poets like Srygley-Moore need to be read and talked about, but because this book, miracles of the Blog, is in many ways potentially detrimental to Srygley-Moore’s career as a poet. Here, I’m not talking about the poetry; I’m referring to the book’s design, layout, and editing. The cover art, a collage done by the poet herself, is fascinating, but repulsive to the eye in the way it’s laid out beneath the title. I can’t think of a less aesthetically pleasing or even provocative font or set of colors for the title. It looks less appealing than even the bleakest perfect-bound undergraduate literary journal, and the back cover is worse. Fonts and typeface changes occur throughout the book without any reason, and the Editor’s Acknowledgement is completely superfluous, as is the preface (and both sorely need copyediting). Why do we need to know from an external source that, “Yes, everything is a miracle, because I am still alive. I do not say I am re-born, but I am certainly un-dead.”? All of this detracts from a textually beautiful collection of poems, and Srygley-Moore deserves better. Here’s hoping you’ll overlook the aforementioned blights and that she finds a publisher better suited for her talents in the very near future. Dan Coffey is the Languages and Literatures Librarian at Iowa State University. His poetry has appeared in publications such as Ocho, Kennesaw Review, and Dirt. He has also written articles on Joanne Kyger, Anne Waldman, and Susan Howe, and numerous book and music reviews. He publishes a podcast that focuses on experimental music and poetry that can be found at http://pftbpodcast.wordpress.com.